FORT LEONARD WOOD – Captain Tony Cech, an Army chaplain here, baptizes one of 20 soldiers and trainees. According to Southern Baptist Captain Jose Rondon, more than 200 have professed faith in Christ on the military base here in March. Photo courtesy of Jose Rondon. 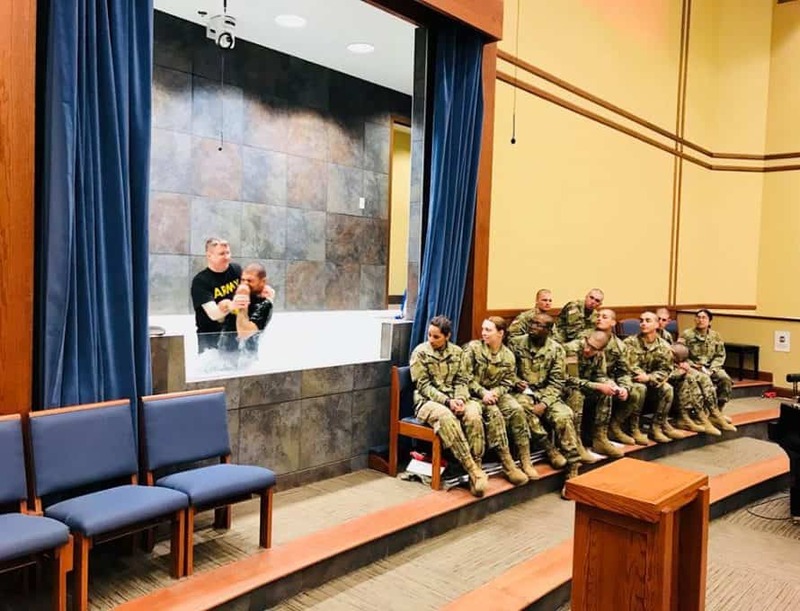 FORT LEONARD WOOD – Professions of faith have tripled since March among trainees and soldiers at the military base here. According to the latest reports, nearly 900 soldiers and trainees in the United States Army have given their lives to Christ at Fort Leonard Wood since March 11. As reported in the March 27 edition of The Pathway, more than 200 soldiers and trainees professed faith in Christ during chapel services on March 11 and March 18, according to Southern Baptist Chaplain, Captain Jose Rondon. And, by April 1, the number of professions rose to more than 328. But, in a June 17 social media post, Rondon wrote that he had counted 668 first-time professions of faith since March 11. That morning, he reported, 108 soldiers and trainees came to Christ during a service that featured the baptism of 22 others. Then, on June 24, he reported that an additional 212 professed faith in Christ, bringing the total to 880 since March 11. Rondon has served as a chaplain at Fort Leonard Wood since early this year. Originally from Venezuela, he came to faith in Christ in the 1990s through the witness of an International Mission Board missionary. Later, he immigrated to South Carolina, where he attended a Southern Baptist college – North Greenville University – and then worked on master’s and doctoral degrees at Southeastern Baptist Theological Seminary. He became a United States Citizen in 2010 and a year later joined the military with the hopes of becoming a chaplain. To learn more about Baptist military chaplaincy, visit the North American Mission Board website at https://www.namb.net/chaplaincy/military.